A new residential development is coming to Woodbridge. 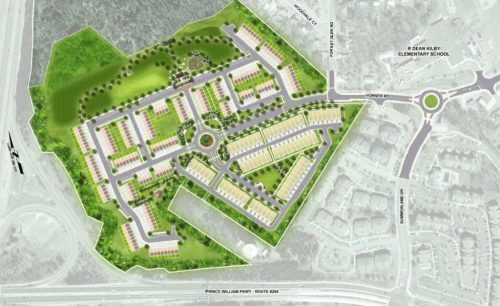 Members of the Board of County Supervisors (BOCS) approved the construction of 325 townhouses and multi-family units at a meeting on Tuesday. Known as “Ray’s Regarde,” the development will be located on Horner Road, near the Prince William Parkway and I-95. The property isn’t heavily traveled and contains many buildings that are boarded up, according to Pete Dolan, who represented the applicant. The Prince William County School Board has voiced opposition to the project. Its impact on the school system and the Occoquan-Woodbridge-Lorton Volunteer Fire Department (OWL VFD) was described in an email from Supervisor Frank Principi’s office. Several county residents commented on the new development. Diana Hall, who works for Woodbridge Middle School, was among them. Project leaders plan to begin building a roundabout, sidewalk and second entrance to Kilby Elementary School in 2020, Dolan explained. The development’s construction is expected to be completed in 2027.